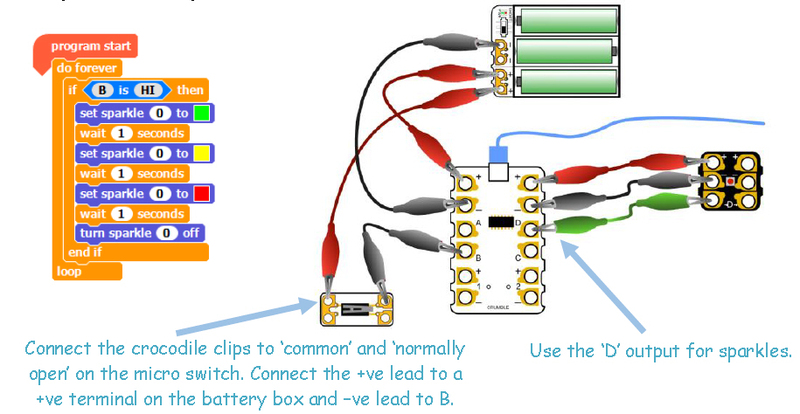 Two Projects on a Page Primary Crumble Planners: Years 3/4 Simple Programming and Control and Years 5/6 Monitoring and Control. These are updated versions of the original planners that came with Projects on a Page. 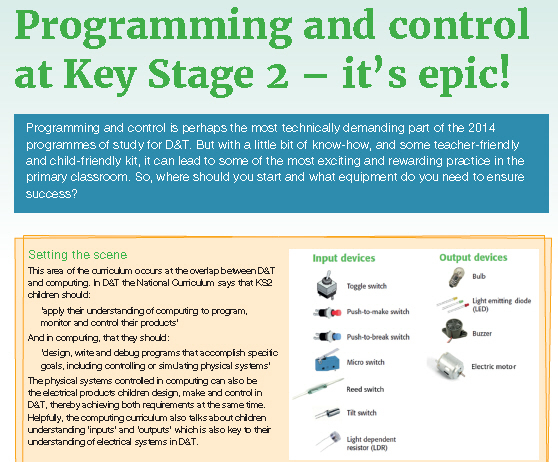 ‘Programming and Control at KS2’ article from D&T Primary #32 looking at input, output and process, hardware and software and one school’s experience of designing and making a colour-changing nightlight. The Crumble has four Input/Output pads which allow connections to switches, LDRs, low power LEDs and so on. It can also drive two motors forwards and backwards at variable speeds. 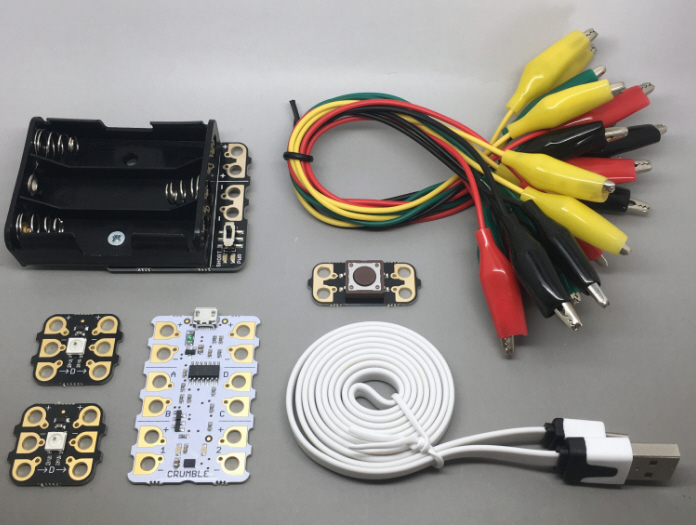 Also available is the Crumble-friendly Components Pack which has eight of the most commonly used electronic components, mounted on ‘Crumbs’ – PCBs with croc-clip friendly connections. The projects included on the planners will require components from this pack. Crumble software runs on PC, Mac and Linux (including the Raspberry Pi). Inspired by MIT Scratch, programs are simply built by snapping blocks together on screen. Sending a program to the Crumble is almost instant, allowing rapid experimentation. The Crumble can digitally control full-colour LED, called Sparkles (two are included). Software is free and can be downloaded from Redfern Electronics. New switched battery box and a Crumble-friendly switch. “They loved the Crumble from the outset – even programming it simply to turn an LED on and off was a source of great excitement! They quickly learned how to attach and program the sparkle, motor, buzzer and filament bulb, with little input from me”. Postage and Packing is £4.95 +vat on most Crumble orders. Once purchased, the planners and article will be made available through an emailed link. The Crumbles will be dispatched from Mindsets UK. Remember to log in to get your membership prices.